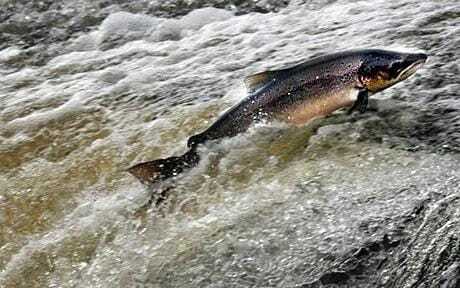 Salmon may stop returning to England's rivers as climate change forces the fish further north, according to scientists. From the Daily Telegraph website. The loss of the fish in world famous salmon rivers like the Test and Itchen in Hampshire or the Frome in the West country will not only affect biodiversity but devastate the local economy. The UK Government are so worried about the problem they are currently funding a study using the same technology that was used to study life on Mars and dinosaur remains to look at how climate change is affecting the fish. Salmon populations in the UK have plummeted 70 per cent in the last 30 years, according to the North Atlantic Salmon Fund. Chairman Orri Vigfusson said the reason for the decline is because plankton is declining in the normal feeding grounds due to a rise in temperatures. It is assumed the fish will either die attempting ever longer migrations or adapt by breeding further north. He said: "Salmon are having to travel longer distances to get farther north to maintain their traditional migration pattern and way of life. "If the trend continues, grilse (young salmon) in the UK and Europe may become a thing of the past and we should investigate how this was allowed to happen and who is responsible." The Government is funding research into the movement of salmon at the National Oceanographic Centre (NOC) in Southampton to find out more about the problem. The study is analysing the chemical composition of the salmon's scales, using some from the river Frome in Dorset. From the scales the researchers can establish what the fish ate and whether at the time they were in a productive part of the ocean. The same techniques of analysing the presence of water and where it has been have been used to investigate possible life on Mars and also on dinosaur projects. Project leader Dr Clive Trueman said: "We're trying to understand the link between the climate and fish by working out what they're eating and what the fish are depending on. There's a hypothesis that the numbers of salmon fluctuating with climate is to do with plankton abundance and therefore if the plankton are changing their distribution as a result of climate change then we would predict that would impact on the salmon population."